West Suburban Bank proudly extends their services with the addition of their 37th branch on the north side of Aurora at 1311 Butterfield Road, Suite 111. On Thursday, October 10th,the newest Aurora location held its ribbon cutting ceremony and invited Aurora Chamber Members and Local Business Owners to join in on the festivities. The event began with refreshments and a spread of finger foods for the guests to enjoy as they conversed amongst each other. Bank management and bank employees enjoyed having one-on-one time with their new neighbors. Later, the ribbon cutting took place inside the branch. 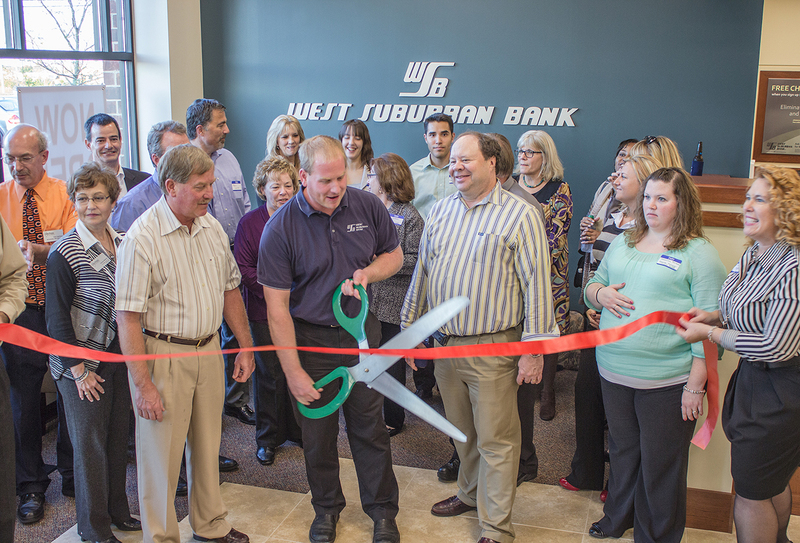 The group joined in on the excitement as the facility manager for West Suburban Bank/Lombard, Matthew Acker, cut the ribbon and inaugurated the opening of the newest Aurora, West Suburban Bank branch. To wrap up the night of fun, West Suburban raffled off three cash prizes to the guests. An Aurora resident was the $100 winner. West Suburban Bank looks forward to being a part of the North Aurora community. Stop in and say hello to your new neighbors.